A few weeks before the première of Alfred Hitchcock’s immortal salutation, “Good evening,” another film giant took to the small screen to introduce a new program with, “Good evening. My name’s Wayne.” John Wayne’s involvement in Gunsmoke is the stuff of legend—or more likely, Hollywood publicity. He may have begged Western director Charles Marquis Warren not to sell out in TV and he may have gotten star James Arness drunk so he’d accept the lead role—both claims seem ambitious—but he definitely appeared onscreen calling new Western drama Gunsmoke the best of its kind. “It’s honest, it’s adult, it’s realistic.” Indeed, that first episode is called “Matt Gets It.” After a fast-fingered fugitive guns down his pursuer in the streets of Dodge City, Marshal Matt Dillon, a tree of a man, steps in to see justice done. And right then, Matt gets it, dropping to the ground as the fugitive gets away. Welcome to the adult Western. Writer John Meston, who received a “story by” credit for the episode, and associate producer Norman Macdonnell made a list of cowboy clichés they wanted to avoid before embarking on Gunsmoke. Meston was particularly vigilant. In a letter to the New York Herald Tribune, he railed against handsome, spotless crooners like Gene Autry and Roy Rogers ostensibly doling out justice. “My hated figure is the Western hero who rides along looking like a transvestite, strumming his guitar, nasally singing a synthetic ballad, and looking for all the world like a fugitive from a cheap circus.” So whitewashing be damned. For better or worse, nobody’s going to confuse Matt Dillon for a radio legend. Except in the obvious sense. Like many early Gunsmoke episodes, “Matt Gets It” began life as a radio script. D-Day veteran Macdonnell and well-educated ex-Army censor Meston met in the late ’40s working on the radio anthology Escape. It was there that they began brainstorming ideas for an adult Western, and it was there that they gathered a stock company of actors (John Dehner, Lawrence Dobkin) and writers (Les Crutchfield, Kathleen Hite) who would eventually work on that Western. Meston wrote two Western-themed episodes for Macdonnell’s shows, a 1950 episode of Escape called “Wild Jack Rhett” and a 1951 episode of Romance called “Pagosa” voiced by radio star William Conrad. Throughout these years the duo kept working on their version of an adult Western. They called it Jeff Spain. Meanwhile CBS mastermind William S. Paley came up with the “MTV cops” of its day. He wanted a “Philip Marlowe of the early West.” So network vice president Harry Ackerman rounded up his staff, and the brainstorming began. There’s debate over how the name Gunsmoke came up, but Ackerman settled on that evocative title before he determined any other detail of the show. CBS rejected Macdonnell and Meston’s Jeff Spain for sounding like the name of a villain more than a hero. Sound was everything. Newman wrote a story about Dillon standing up to a mob with a climactic standoff and an ironic ending: an onlooker dazzled by Dillon’s bullet-powered command would grow up to be Billy The Kid. Composer Rex Koury sat down on the morning of the show and took 10 minutes to scrawl on a magazine what would become one of radio’s most iconic themes. After a week of begging a reluctant network, Macdonnell and Meston finally got their first choice, William Conrad, to play Dillon, and everything was set. The Macdonnell/Meston vision of Gunsmoke was born, and the first episode aired in April. At the time, Matt’s dim but dependable right-hand man Chester was simply Townsman. He and crusty Doc Adams were both named by Conrad. The fourth leg, Amanda Blake’s saloon girl, Kitty Russell, would join the regulars a few weeks later. Meston became a nearly full-time freelance writer for Gunsmoke’s second season. He produced about 40 scripts a year for the next three years and was one of its primary authors, known for spare dialogue and tough themes. Gunsmoke was so popular that it somehow stayed afloat for nine years under Macdonnell’s supervision, but the decline in radio dramas was obvious from the get-go. So Macdonnell and Meston approached CBS about making a TV version. They were surprised to learn that CBS was already working on it without them. Charles Marquis Warren had been hired to develop the series as producer-director, and Macdonnell had to content himself with associate producer. The radio cast wasn’t even being considered for the show until Los Angeles Times reporter Hal Humphries began a daily petition in his column. After token auditions, they were all rejected. At least Koury’s theme made the jump. The TV characterizations were a little less rough around the edges than those on radio. Chester gained a drawl and a limp in the casting of Dennis Weaver. Adams’ crust covered a heart of gold, or at least silver, in Milburn Stone. As a seemingly beaming paragon of virtue, James Arness’ Matt Dillon stood a head taller than everyone else like a comic-book superhero. Matt was perhaps the only patriarchal figure in all of ’50s TV who also frequented a whorehouse, though not in so many words. Macdonnell told Time that radio Kitty was a prostitute, plain and simple, but now Kitty was the woman who ran the Long Branch saloon. What she did with her offscreen hours was anyone’s guess. Still, Gunsmoke was a far sight from the usual TV Western programming. A 1949 NBC survey found that kids preferred Westerns to everything else, including programming geared toward children like Milton Berle’s Texaco Star Theatre. In the early ’50s, Westerns tended to be heroic adventure shows, built on broad comedy (The Cisco Kid), serial tropes (The Lone Ranger), and hummable tunes (The Gene Autry Show). They were easy viewing. Then there were transitional Westerns for the whole family in the mid-’50s like Davy Crockett: Indian Fighter, and even serious psychological Westerns like Stories Of The Century. Gunsmoke debuted in the 1955 season with three other adult Westerns: NBC’s hardscrabble, prestigious Frontier, ABC’s steely serial The Life And Legend Of Wyatt Earp, and ABC’s Cheyenne—the first hour-long drama and, with Warner Bros. producing, the first original TV show from a major studio. But ABC Westerns were fairly family-friendly with their Boy Scout heroes and worshipful songs. And Frontier, with its female-focused anthology of harsh settlement life, has obvious roots in Death Valley Days, a rich, 18-season kaleidoscope of pioneer life created by Ruth Woodman (based on her earlier radio show that ran for more than 20 years). When Gunsmoke debuted, there was nothing quite like it on TV. The movies were another thing altogether. The no-nonsense naturalism of Charles Marquis Warren’s Old West historical dramas Little Big Horn and Seven Angry Men made him just the man for the job of overseeing Gunsmoke. For the TV pilot, he directed a John Meston script called “Hack Prine,” about a man who once saved Matt’s life now hired to kill him, but CBS ordered a second pilot, and “Matt Gets It” kicked off a 20-year run that fall. (“Hack Prine” aired out of production order the following spring.) CBS wanted a smoking-gun opening, but instead, Warren followed a distanced shootout with a mournful sequence in which Matt tramps through windy Boot Hill Cemetery saying things like, “How many times I’d rather have argued than gone for guns.” Not only does the opening befit the adult Western, but it’s truer to the existential drama of Meston’s universe. Two men shoot, but only one visits the cemetery. Gunsmoke is a universe of consequence. Every four days Warren wrangled a new episode, directing the first 26, producing the entire first season, and occasionally writing as well. Morality tales examined the fairness of gunplay, and Warren’s sensitive, unfussy style emphasized the family dynamic of the main characters in a corrupting city (“the Gomorrah of the Plains,” Matt calls it). But Macdonnell was an unhappy subordinate, and Warren eventually banned him from the set. “I felt his resentment. You couldn’t blame him.” The tension caused Warren to move on during the second season. A couple years later, he’d shepherd Rawhide for CBS, the first of several Western artists to pass through Dodge, a list that includes Sam Peckinpah (The Wild Bunch), Joseph H. Lewis (Terror In A Texas Town), Andrew V. McLaglen (Have Gun — Will Travel), Ted Post (Hang ’Em High). 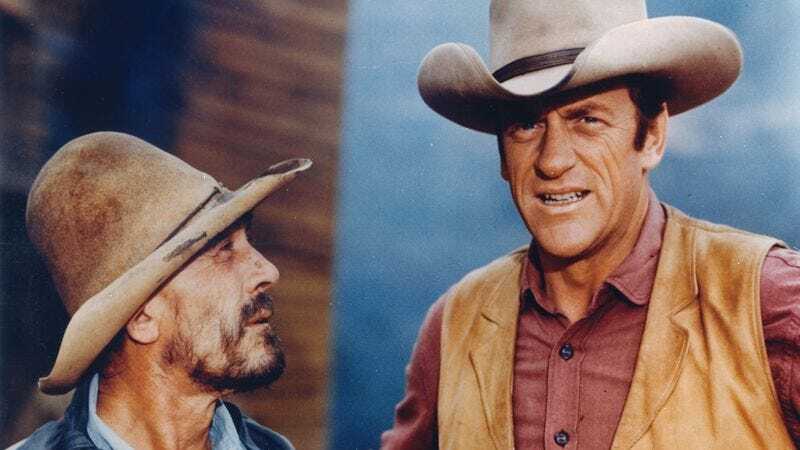 Gunsmoke wasn’t immediately popular, though it did garner an Emmy nomination in 1956 for Best Action/Adventure Series (which it lost to Disneyland), and one for James Arness the following year when it placed eighth in the Nielsens. Over the next four seasons it was the No. 1 show on television, sailing past its 100th episode (and 200th) with Macdonnell as producer and Meston as the regular writer. Meston contributed 257 scripts, almost five times as many as the next highest writer. Their reign indulged the darkness of Warren-produced Peckinpah episodes like “The Guitar,” in which two troublemakers try to hang an ex-Union Texan, not in an effort to highlight character flaws but to draw out a pervasive futility to Marshal Dillon’s work. “No Indians” deals with a false flag operation, for instance, and “The Cover Up” involves a fatally committed marriage. The series won its only Best Drama Emmy in 1958 under Macdonnell and Meston, and Arness, Weaver, and Meston were also nominated that year. Gunsmoke led the stampede of serious Western programming in the late ’50s. Paley even got his Phillip Marlowe in the West, complete with a smoking-gun intro, with Have Gun — Will Travel, about a detective-for-hire who prefers to outwit his opponents rather than outdraw them. Gunsmoke’s fingerprints were everywhere: the rugged resignation of Have Gun, the paternal hero of The Rifleman, the mob pilot of Zane Grey Theater. Fresh off its four-year high, Gunsmoke expanded to fill an hour in season seven, which allowed the scripts to establish the guest cast and episodic plot first, instead of waiting for them to interrupt Dillon’s daily grind. Nevertheless, the show dropped to No. 3, beginning a slow slide out of the top 20. The following year a fifth regular was added, Burt Reynolds’ half-Comanche blacksmith Quint Asper, and the mid-show personnel juggling commenced. Dennis Weaver had been feeling confined by the role of Chester for a few years, and he left in season nine, but not before sharing an episode with his replacement, Ken Curtis’ hillbilly deputy Festus Haggen. The following season, Macdonnell turned the reins over to producer Philip Leacock, a Route 66 director. Reynolds also departed that season, replaced by Roger Ewing’s corn-fed giant Thad Greenwood, who only lasted two years himself. Next Gunsmoke transitioned to color after 11 seasons in black-and-white. Whereas NBC’s crisp Western flagship Bonanza is clean and vivid in its coloring—the better to show off the television sets parent company (and Bonanza sponsor) RCA was selling—Gunsmoke took color as an opportunity to get grimy and gritty. A telling contrast: Gunsmoke was historically sponsored by cigarette companies. Macdonnell and Meston’s authenticity guides the muddy sets and muted costumes. In addition, the color transition seemed to lay bare the horrific violence of the series. Gunsmoke was now less about stylized figures in the archetypal city square than bruised bodies and smeared dirt on striving settlers. It didn’t take Chester rubbing his back on a fence post to tell viewers he hasn’t had a bath in weeks. They could see it for themselves. That season Gunsmoke placed 34th, its decline neither accelerating nor slowing. CBS was set to cancel the series until Paley noticed it was missing from the fall schedule. The network programmers rectified their mistake by canceling Gilligan’s Island and the new, poorly tested comedy Doc instead. Gilligan producer Sherwood Schwartz blamed Paley’s wife Babe for getting her husband to intervene on Gunsmoke’s behalf. Gossip aside, the move paid off: Gunsmoke was back in the Nielsen Top 10 for the next six seasons, and Gunsmoke got its third wind as an hour-long color Western. In season 13, Gunsmoke settled into its final form: Thad gave way to Buck Taylor’s versatile Newly O’Brien, John Mantley took creative control as producer, and Gunsmoke moved from Saturday nights to Mondays. Around that time, the television anti-violence movement finally picked up steam. In 1959 ABC’s The Untouchables made a splash with violent content, sparking competition among the networks. But ever since Matt got it, Gunsmoke had felt the weight of its title. Imagined by World War II vets (not just Macdonnell and Meston, but also Mantley and writers like Ron Bishop), it’s no accident that Gunsmoke was full of trigger-happy men facing up to their own violence. Peckinpah wrote several such episodes, including “Poor Pearl” about a love triangle gone violently haywire, before moving on to develop The Rifleman, create The Westerner, and go into features. In Meston’s mind, “The West after the Civil War was, in a sense, a kind of arena for frustrated gladiators.” Even Kitty is forced to kill in season 12’s “The Jailer,” shooting her captor dead and then collapsing in despair against the wall. Nevertheless, news from home (assassinations) and abroad (the Vietnam War) built publicity for the television anti-violence movement, and Congress took notice. CBS flagship Gunsmoke made for a juicy target, just as former Untouchables writer Mantley did. So the networks preemptively made their own content restrictions, and Mantley found himself in the position of changing the very core of Gunsmoke. “The words that can kill this show are, ‘Let’s do it differently.’” But that’s exactly what he had to do, shifting the dramatic burden from violent conflict to dramatic conflict. Because the regular cast were a makeshift family, big-name guest stars had to come in to generate the stories and shoulder most of the episode, and children had to pour into Dodge to round out the rough edges. Mantley also had to pivot away from Meston’s ripped-from-the-headlines brutality toward more contemporary social issues like racial prejudice (“The Scavengers”) and mental disability (“The Deadly Innocent”). This freedom from the historical record combined with a budget increase to send Dodge’s marshal out on location more, outside of his jurisdiction, but within sight of beautiful vistas like Taos and Sonora. Mantley’s success is evident in the ratings, and during these years Gunsmoke also received some Golden Globe attention, including three consecutive nominations for Amanda Blake. But after 19 seasons in the same role, Blake decided to leave, making Arness and Stone the only cast members to last the entire run. Season 20 wasn’t intended to be the last; Mantley was already preparing scripts for the next season when he got a call on his 55th birthday that the show was being replaced by Mary Tyler Moore spin-offs Rhoda and Phyllis. It wasn’t the declining ratings so much as who exactly stuck around. Gunsmoke’s audience had become elderly and rural. In 1975, the last man standing from the heyday of the Western took his bow with just another episode. With 635 episodes, Gunsmoke remains America’s longest-running live-action prime-time drama. Matt, Kitty, Newly, and (Kitty’s final-season replacement) Miss Hannah reunited for a 1987 TV movie produced by Mantley and directed by regular Vincent McEveety. Gunsmoke’s influence extends from the Andy-Barney relationship on The Andy Griffith Show to ornery Dr. McCoy on Star Trek. The story of Deadwood is essentially incomplete without Gunsmoke. The HBO tapestry does for its predecessor what it did for the earliest Westerns. Deadwood even opens with a twisted take on the first episode of Gunsmoke, the hero marshal standing in the way of mob violence, and the last villains to face Matt Dillon and Sheriff Bullock are both played by Gerald McRaney. In Deadwood, Kitty becomes quite explicitly a prostitute and madam, Doc becomes almost disturbingly grizzled, and the love-struck sidekick becomes decidedly hornier. Most tellingly, Marshal Dillon’s latent rage is amplified in Timothy Olyphant’s Seth Bullock, taking root in his clenched jaw. That’s the secret power of Gunsmoke: Deep down Matt Dillon isn’t really a Father Knows Best Eisenhower ideal. The flashes of anger that flare up, say, after he accidentally shoots an old friend (season two’s “The Round Up”) or when the town is held prisoner by a gang, Day Of The-Outlaw-style (season 11’s “Seven Hours To Dawn”) get at the heart of the show. The one thing that stayed the same from the paranoid chill of the Cold War to the grisly heat of Vietnam is the psychological focus on men somehow unleashed by war and now explosively unable to submit to the ordering force of civilization. Violence, whether early and often or studiously rationed, isn’t just a plot point on the way to the hero’s victory. Violence has taken Quint’s father, Thad’s father, and presumably Chester’s leg. It has scabbed over Dillon and Doc’s world-weary personalities, and it has openly and not-so-openly threatened Kitty. In these characters, violence leaves bodies, and limps, and resignation, and it rabidly perpetuates inequality. The great legacy of the adult Western is that on Gunsmoke, which spans the entire Vietnam War, violence is a thing worth taking seriously. On Gunsmoke, television grew up.